Mazda have teased us with images and video of the Mazda3 MPS. Now, as part of their Geneva Auto Salon program, they have gone the whole nine yards and released a full suite of images and comprehensive details of their hottest hatch. 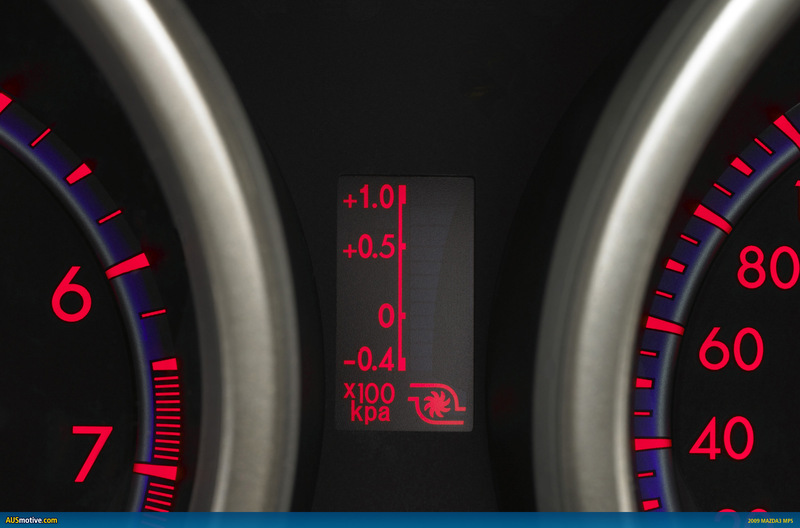 Peak power from the 2.3 litre turbo four cylinder, at 191kW, is no great leap forward from the previous model. Same goes for the 380Nm peak torque. Visually, though, the Mazda3 has a fresh look that takes the car forward. The somewhat controversial smiling face actually looks much better in person than in pictures, and that massive air intake on the bonnet helps to give the MPS a character all of its own. 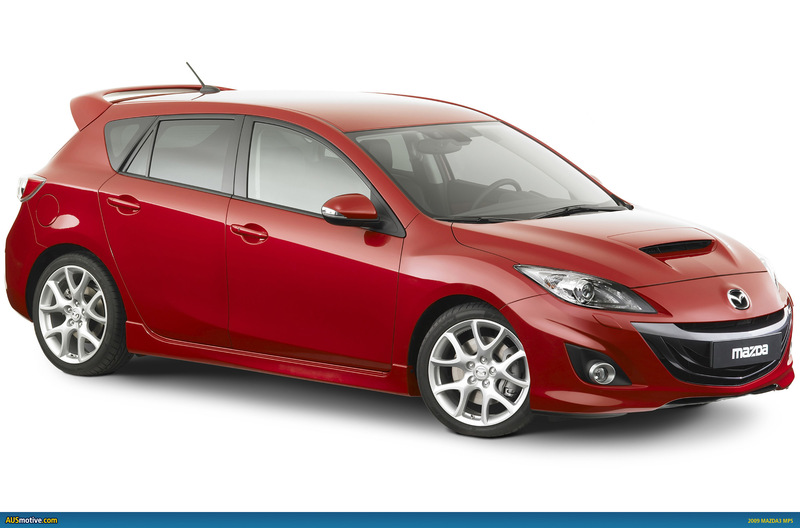 Torque steer was always one of the pitfalls of the previous gen Mazda3 MPS. With more than 250bhp being sent to the front wheels, is it any wonder? No surprise, then, that the Mazda boffins have fiddled around a bit to make improvements in the new model. Things such as tweaks to the driveshafts, a torque sensing limited slip diff and torque supression system should help to give the 18″ front wheels a fighting chance. There’s plenty of images and text after the jump to keep you busy for a bit. As always, click on each pic to load a wallpaper sized 2000x1320px super image. UPDATE 4 March: Don’t forget, Melbourne readers can see the new Mazda3 MPS for themselves from today onwards at the Melbourne International Motor Show. This marks the worldwide public debut for the car, pretty cool, huh! We are proud to introduce this new line-up of finely crafted cars that offer the exhilaration of driving pleasure and tangible attributes to excite drivers and once again exceed customer expectations. 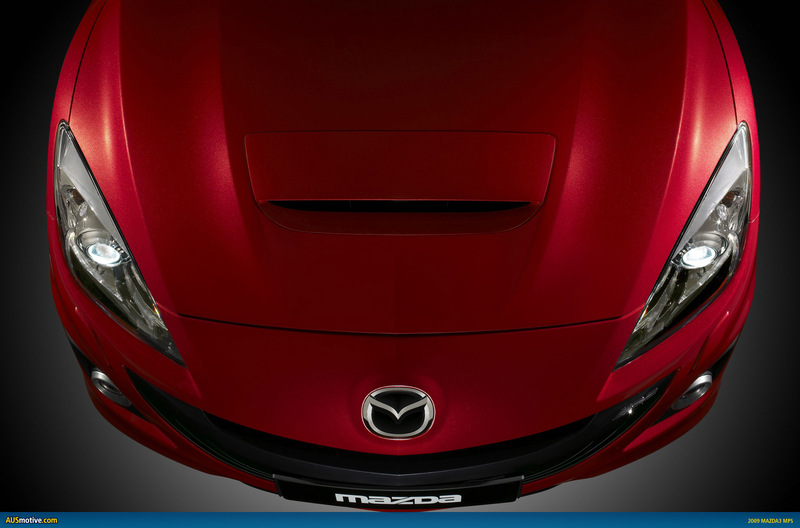 This is an exciting sports compact car that represents the Mazda brand – the all-new Mazda3. Within the new line-up, we developed the Mazda3 MPS as the flagship model that pushes design and driving performance to the limit. 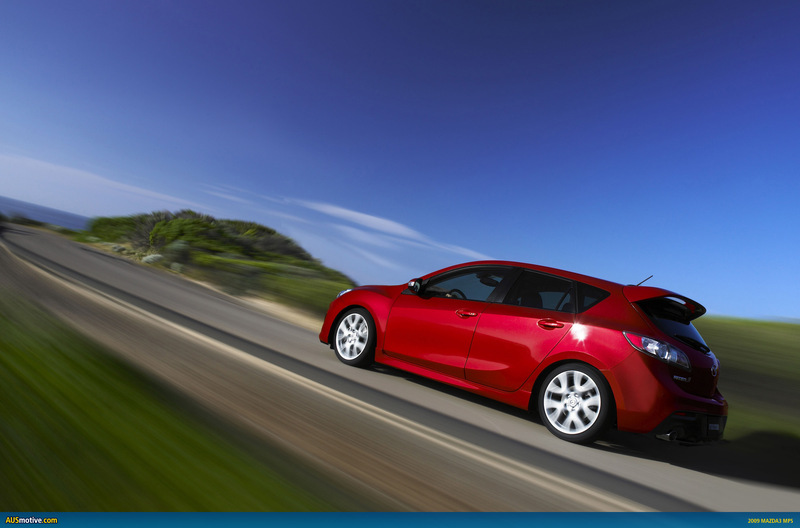 And the Mazda3 with i-stop assumes its role as the environmental strategy car that embodies “Sustainable Zoom-Zoom”. The new Mazda3 MPS builds on the popularity and recognition of the model it replaces, evolving the experience to an entirely new level of quality and pleasure with its emotional design and exhilarating performance. The “i-stop” differentiates itself from other recent efforts to deliver an environmental strategy car by implementing Mazda’s own environmental technology to achieve best-in-class fuel economy as it aims to greatly exceed the expectations of our customers. 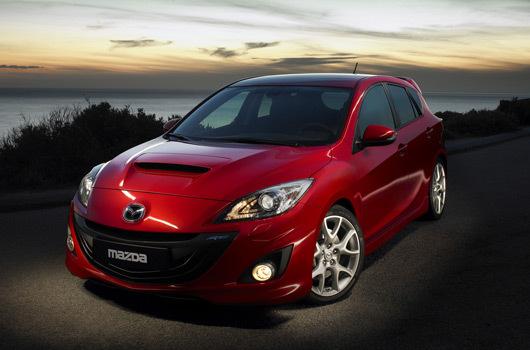 These two models add extra value to the already strong appeal of the new Mazda3 series line-up. The new Mazda3 series takes a significant step ahead in both the realms of driving performance and environmental technology to lead the way toward a new generation of motoring. Sharing the spotlight in Geneva is the next-generation Mazda3 MPS, one of the world’s most powerful front-wheel drive compact cars. It takes the all-new Mazda3 hatchback as its base and raises it to new levels of driving excitement with an updated MZR 2.3-litre DISI* turbo petrol engine, increased body shell rigidity and an evolved suspension. To this it adds exclusive design cues and materials to deliver a next-generation compact flagship that is even more fun to own and drive than the current model. 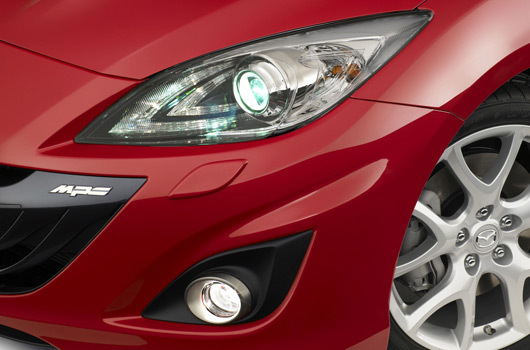 On top of its high performance level – one of the best in the category – the all-new Mazda3 MPS was developed according to Mazda’s long-term vision for technology development. Advanced Mazda engine and catalytic converter technologies mean the new model has an optimized power delivery, uses less fuel, and has cleaner emissions than the previous Mazda3 MPS model. The design theme for the all-new Mazda3 called on the development team to evolve the model’s visual identity to create a sportier, more aggressive appearance. The end result is a more emotionally appealing design that takes the sporty, agile compact nature of the all-new Mazda3 hatchback to a new level of sporty refinement. 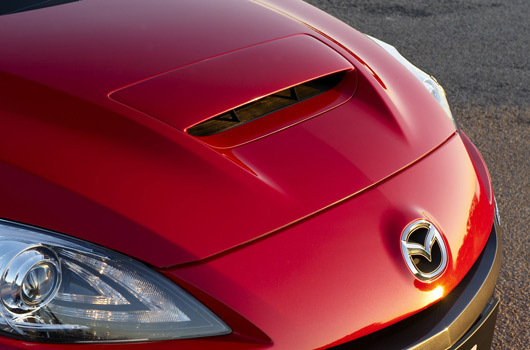 A new air intake for the intercooler is introduced to the centre of the all-new Mazda3 MPS bonnet, hinting at the power underneath. The front fender and front bumper designs are exclusive to the MPS, while subtle intonation added to the surface and character lines give the exterior an expressive and dynamic flair. The front grille and lower bumper sections share the same black metallic paint finish. These are framed by cylindrical bi-xenon headlamps and round fog lamps, to underscore the car’s premium character (standard or option, depending on market). At the sides, subtle wedge-shaped and curving side character lines, along with a side under spoiler, accentuate the car’s sporty, low centre of gravity. The view from the rear features a large floating rear spoiler (depending on market) that balances out the tight look begun by the new front end and adds to the compact’s aggressive image. LED tail lamps have an inner lens that adds a sense of greater transparency when the lamps are not lit. The all-new Mazda3 MPS has an exterior design that continues the current model’s top aerodynamic performance. Beginning with the all-new Mazda3 5-door hatchback, which has one of the segment’s lowest coefficients of drag, MPS developers added a number of exterior features optimised for aerodynamic efficiency. 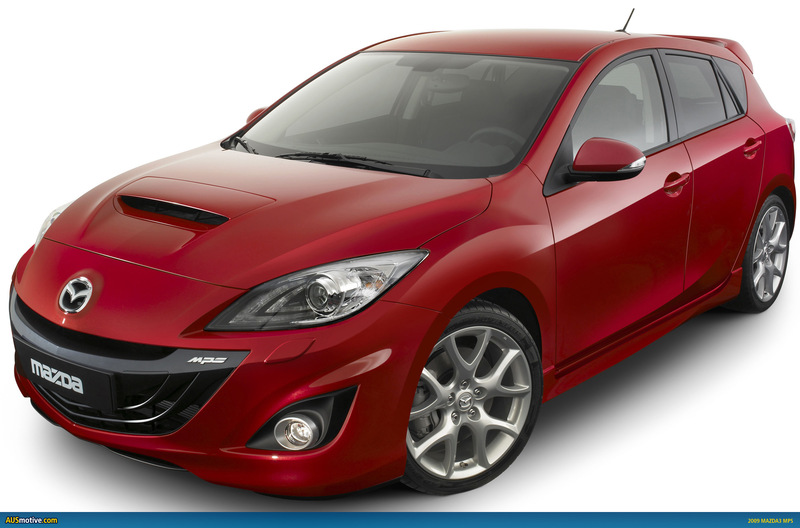 These include the large front and rear bumpers, a large floating rear roof spoiler and front under spoiler. The result is aerodynamic performance that provides stability and easy control when travelling straight, changing lanes, or overtaking other vehicles at high speeds. The shape of the A-pillars and door mirrors were also designed keeping aerodynamic efficiency in mind, while increased rigidity around the door sashes, delivers improved sealing of the doors to reduce wind noise. Mazda introduces all-new 18-inch (18 x 7.5J) aluminium alloy wheels designed exclusively for the Mazda3 MPS using the same design theme as the Mazda RX-8 wheels. These have a strong, three-dimensional form that helps the car look nimble and aggressive when seen from the side. 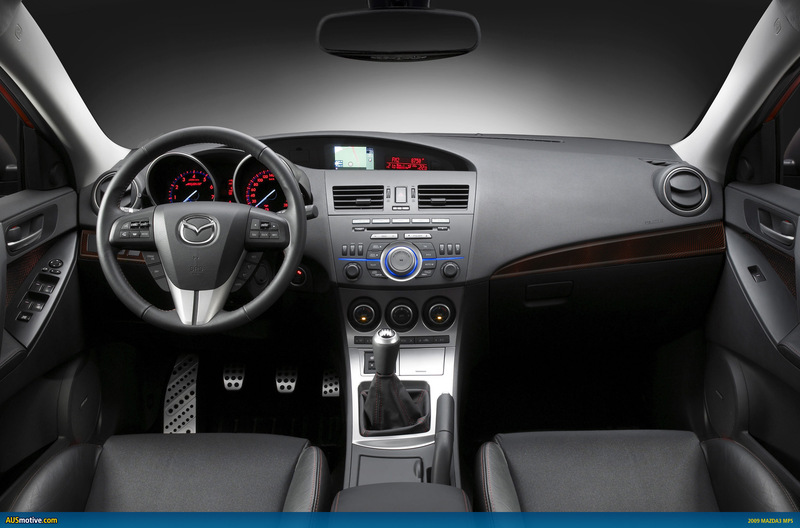 The dashboard of the new Mazda3 MPS is designed to give a roomy feel at the front. This is combined with a large centre console and a driver-orientated, wrap-around cockpit with just the right feeling of snugness. Exacting calculation was applied to designing the slant of the centre console and in positioning the gearshift lever closer to the driver. The hoodless independent blackout speedometer and tachometer express sportiness through their design. 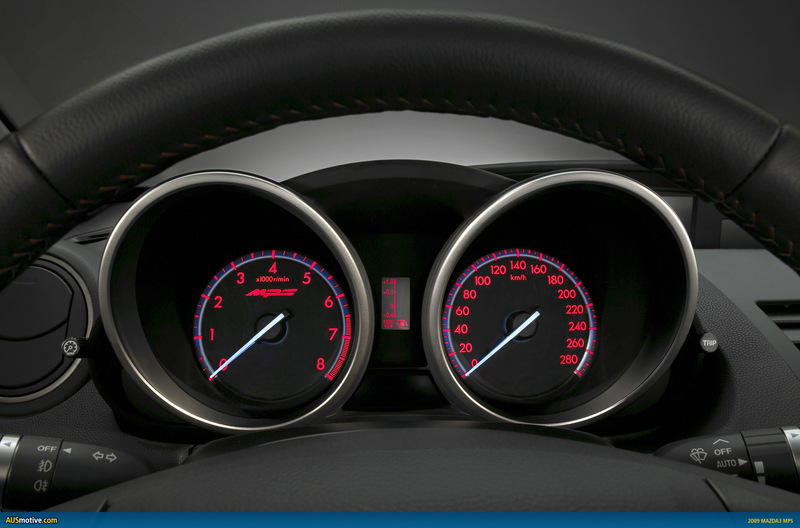 The tachometer features a red MPS logo and a needle that travels 260 degrees as opposed to the 190-degree rotation on other Mazda3 models. The instrument cluster for the all-new MPS also includes an LED turbo boost gauge positioned between the meters, which heightens the car’s high-performance feel. The all-new MPS provides semi-bucket front seats for a great fit and exceptional torso and thigh support, a real must in a car this sporty. The front edge of the seat cushions is enlarged to improve the fit under the thighs, and the seatback length is extended to provide greater support. The MPS upholstery features an exclusive black base colour with a red graphic design and red stitching. Developers were careful in selecting materials and surface finishes for the interior that will excite the driver and passengers every time they take a seat in the car. Black is the keynote colour employed throughout the interior, while the seats and trim fabric have an organic red graphic design. 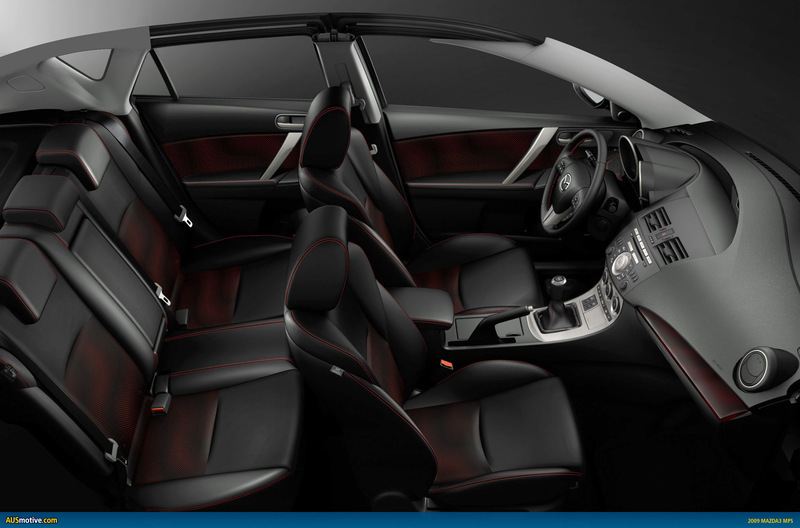 This MPS-exclusive design is distributed throughout, with red stitching enhancing the sporty interior character on the steering wheel, seats, door trim, shift lever boot, and centre armrest. The power and easy-to-control torque characteristics of the new Mazda3 MPS turbo petrol engine are combined with an optimised gear ratio that ensures smooth shift operation for sporty driving. 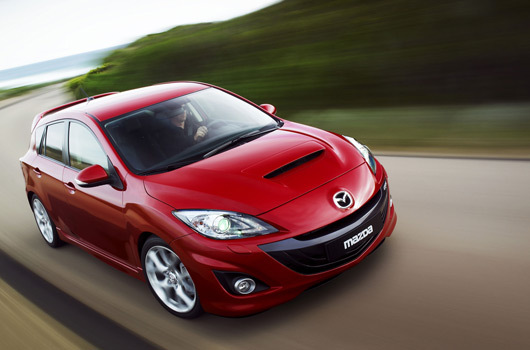 This is matched to a stiffer body, a suspension system with greater damping strength, Mazda’s electro-hydraulic power assisted steering (EHPAS), as well as specially tuned brakes. Together, they deliver a high-performance package with precise, controllable handling, and powerful braking that is fun to drive on a daily basis. 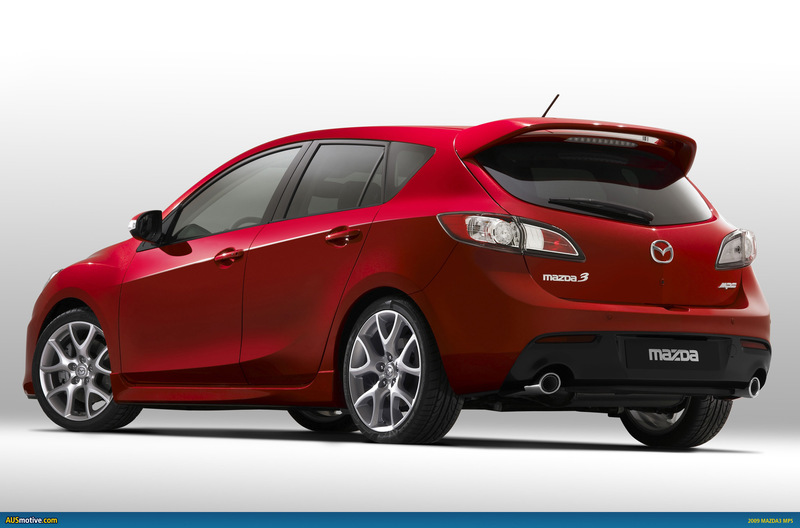 The all-new Mazda3 MPS is powered by Mazda’s MZR 2.3L DISI Turbo, a high-power inline 4-cylinder petrol engine. This acclaimed engine has been further refined and now delivers a maximum output of 191 kW/260 PS at 5,500 rpm and the same generous maximum torque of 380 Nm at 3,000 rpm than the current model. This represents one the world’s highest level of performance in a front-engine front-wheel drive sports compact. Pairing direct-injection with a turbocharger allows the engine to achieve performance that is on par with a larger displacement engine. Realising the right balance between lightweight and high rigidity through the effective use of high-tensile steel sheeting – including 1,480 MPa ultra-high tensile steel – means the new MPS body shell easily supports the top speed of 250 km/h and acceleration of 0-100 km/h in just 6.1 seconds. Yet, the new Mazda3 MPS also delivers surprisingly good environmental performance and fuel efficiency for a car with this kind of power. Optimised aerodynamics helps reduce fuel consumption from 9.7L/100 km on the previous model to 9.2L/100 km on the all-new Mazda3 MPS. Also newly introduced is the world’s first single-nanotechnology, fast-reacting catalytic converter under the floor, which delivers cleaner emissions and Euro Stage V compliance. The latent heat of vaporization generated by the MZR 2.3L Turbo when atomized fuel is injected directly into a cylinder at pressures of up to 11.5 MPa reduces the temperature in the combustion chamber (in-cylinder cooling effect) and improves air-fuel mixture charging efficiency. When compared to turbo engines injecting fuel via regular intake ports, this approach increases torque of the new Mazda3 MPS by up to about 10 percent at around 3,000 rpm. This realizes a smooth flat torque profile with plenty of power that is easy to control using a single-scroll turbo charger. The intercooler is the same size as on the previous model, but the new air intake mounted on the hood delivers a supply of cool air that better ensures stable cooling performance. The stiffness of the left and right drive shafts is optimized to minimize torque steer. Engine optimizations help to make this powerful, high-torque front-wheel drive vehicle easier to handle when enjoying a sporty drive. These measures include intake volume and boost pressure control that suppresses sudden torque peaks for smoother, more linear torque characteristics and steering angle sensors (all gears). The transmission of the new Mazda3 MPS uses a compact, three-shaft design that keeps the overall length the same as a 5-speed manual transmission. It uses a wide gear ratio setting that can fully exploit the wide torque band of the DISI Turbo engine, with a sixth gear that contributes to a quieter ride and improved fuel economy when driving at high speed. Each gear is set to a higher speed total gear ratio than on the previous model. 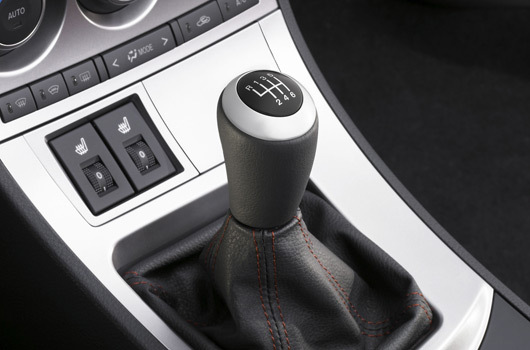 Of particular note is the natural feel of shifting between first and second gear as the car picks up speed, as well as the smooth feel of successive shifts while accelerating. Triple-cone synchronizers for first, second and third gears and a double-cone synchronizer for fourth gear optimize the amount of strength required to make shifts and establish the right balance between a short, responsive stroke and pleasing feel to gearshift operation. 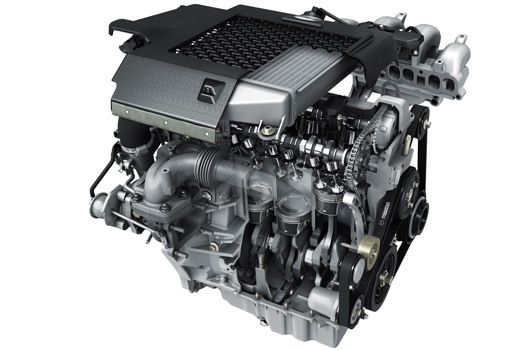 In addition, the transmission uses low-viscosity fluid, which greatly reduces the effort required for shifting when the engine is cold. 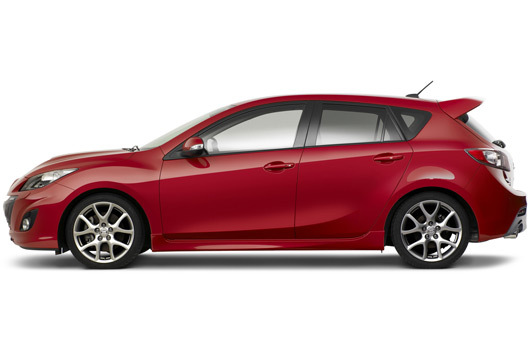 Based on the highly rigid body of the Mazda3 5-door hatchback, the all-new MPS version adds reinforcements inside the front cowl member gussets to strengthen the joints between the rear suspension towers and rear floorboard, and employs a large tunnel member. These and other local reinforcements effectively increase body rigidity and greatly improve the new model’s dynamic robustness. The coil spring rates for both the MacPherson strut front suspension and multi-link rear suspension are modified exclusively for the MPS. Special tuning to support the high power of the MPS and provide satisfying driving performance also includes the introduction of larger diameter stabilizers than on the new Mazda3 base model, and an increased span for the stabilizer mounts to achieve greater roll linearity. Special dampers for the MPS increase damping strength and combine with the coil springs and stabilizers to achieve higher roll stiffness than on the base model. The Dunlop 225/40R18 tyres for the MPS are wider than on the previous model. By improving the grip of the tyres, the rigidity of their sidewalls and damping strength – along with the systems that bear the input from the tires, including body rigidity, suspension rigidity, and steering support rigidity – the new Mazda3 MPS delivers response with a more direct feel, and a stronger sense of oneness between the driver and car. 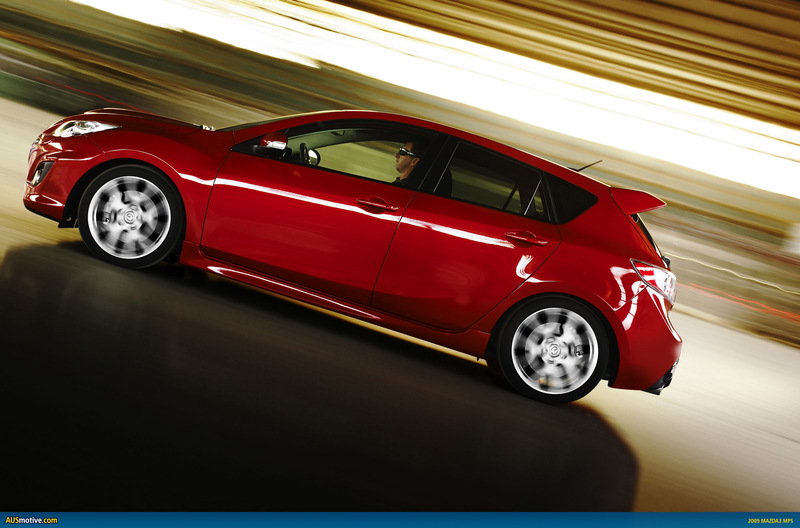 The result is a sporty drive that is more precise than on the previous model, even at high speeds. It delivers better response, greater stability and a flatter ride with fewer undulations, even when entering sharp curves or traversing wavy road surfaces. To ensure this, extensive high-speed test drives were conducted at Germany’s Nürburgring. The new Mazda3 MPS now employs three highly rigid steering gear mount bushings instead of the two used on the previous model. The system also features electro-hydraulic power assisted steering (EHPAS), which adjusts control in accordance with vehicle speed and steering angle to realize precise, solid response for an outstanding feel to steering wheel operation. Control is set for more accurate response to vehicle speed, providing a lighter feeling at slower speeds and a firmer, confidence-inspiring feeling at higher speeds. Steering is direct and sharp at just 2.7 turns from lock to lock. Large diameter 320 mm ventilated disc brakes in the front and 280 mm solid discs in the rear combine with an 8+9 inch tandem brake booster and 1-inch large diameter master cylinder to realize powerful and stable braking. Electronic brake assist replaces the previous mechanical system, and four-wheel ABS and DSC are also standard equipment. Exterior is fine especially the hood scoop. 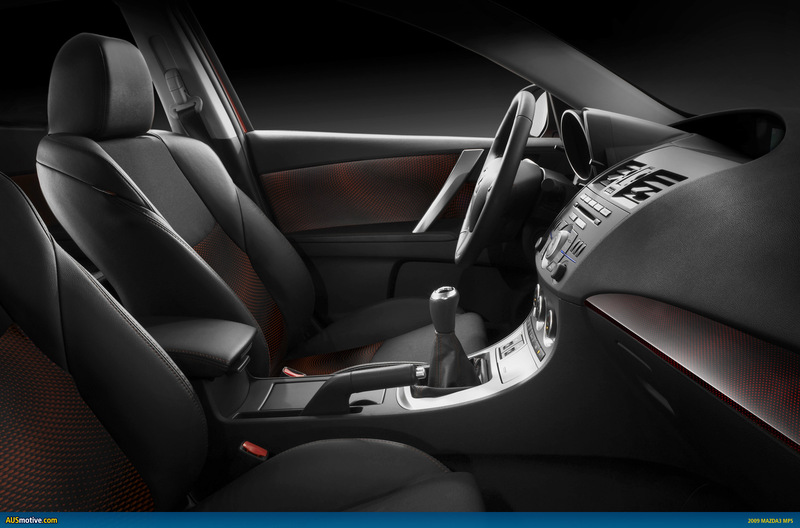 Interior wise, I think the front seat design looks worse than the current MPS3’s fornt seat design. not sure on the interior colour design. maybe they do better in a black car, still very interested in buying one all the same. Nothing new here, just a few things for marketing and for have a rason to make price higher. Nothing practical i found – no new power no new revolutional design and no new features, only new hole in the hood, new glasses in lights and new articles in the medias. May be also new non-posistiv emotions for owners of previous mps. I still like the 2007-year model. 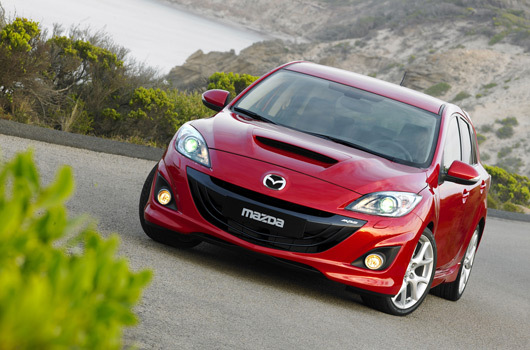 I am writing to enquire about GPS for Mazda3. My name is Krystyna, I am from Poland. I live in Warsaw. Four months ago I bought car Mazda3 with number: JMZBL14Y201162509. Since that moment I have been using it all the time and everything is fine. I am very satisfied with this car and happy that I bought Mazda. But there is one little drawback. When I bought my car Global Positioning System has been already installed in this Mazda. But unfortunately I cannot use it because this GPS does not include map of Poland. In this connection I would be very grateful if You could tell me if there is any possibility to get map to this GPS in which there will be my country – Poland? Maybe I can get it from the website? Or maybe buy?